Used to be a cakes lover, but now you’re worried about your diet program? Do you want to keep enjoying the most delicious and sweet desserts, but don’t want more fat into your meals? 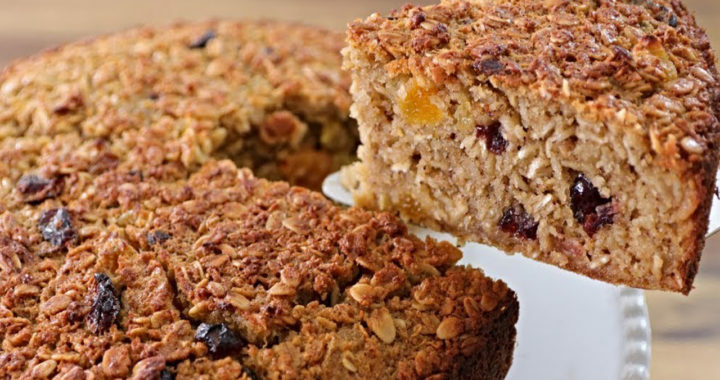 This easy and healthy oatmeal cake may be what you’re looking for. It’s not fatty or gluten and easy to make. 1) The first thing we have to do, is whisk all the wet ingredients in a bowl and set it aside. 2) Next, we mix all the dry ingredients in a separate bowl. Note: dried apricot must be cut into small pieces before mixing with the other elements. 3) And now, as I like to have things well organized, I’ll quickly preheat the oven at 180C degree and get back to my mixtures. 4) I mix the both mixtures together, the wet ingredients and the dry ingredients until they’re well combined. And let the mixture sit for 10-15 minutes to absorb the liquids. 5) Now, we’ll line our pan with parchment paper and grease the edges with some butter. 6) Pour the batter into the pan, and bake it for 30 to 35 minutes until golden brown. 7) Give it around 5 or 7 minutes to cool a little bit, then release from the pan and let it cool completely. 2¼ cups (200g) Rolled oats. 1¼ cups (100g) Quick oats. 50g Dried apricots Butter for greasing. 1/2 (170g) cup Honey/maple syrup. 1 1/3 cups (270ml) Milk. 3 tablespoons (40g) Coconut oil. Tagged Healthy Oatmeal Cake, healthy oatmeal cake recipe, healthy oatmeal coffee cake, healthy oatmeal coffee cake recipe.